Hopefully I won't need to carry this stuff around after Apple Watch Series 3 arrives. The latest rumors about the next-generation Apple Watch indicate it might come with LTE cellular data in a slick new design. But Apple Watch already offers data connectivity via iPhone, and Cupertino’s marketing tends to focus on benefits, not features. So how will Apple craft a new product story around built-in cellular? My guess is it will all be about replacing the need for a very old technology: pockets. Apple Watch Series 3 will move all the contents of our pockets into the cloud. The pocket as we know it emerged in Europe around the 13th century. Initially, pockets were separate leather pouches attached to belts. Later they got integrated into pants. Renaissance dandies filled their new-fangled pocket-contraptions with fancy items such as snuff boxes, ivory fans and lacy hankies. More recently, we began stuffing our pockets with all kinds of crap: keys, credit cards, Hubba Bubba and whatnot. Then, at the start of the 21st century, a technology company in Cupertino ushered in a new golden age of the pocket. Suddenly we needed a place to keep all those shiny gadgets about our person. Jeans companies like Muji even started adding special large pockets to accommodate plus-size iPhones. Apple has a vested interest in emptying our pockets of money and filling them with gadgets instead. So why on earth would Cupertino want to eliminate our pockets altogether? The answer is simple. Apple can be ruthless when it comes to eliminating old technology. The iPod killed the Walkman. And then the iPhone came along and wiped out whole swathes of stuff, like cameras, compasses, maps, books, calendars … even the venerable iPod itself. But the pocket would be by far the oldest and most entrenched technology Apple ever took on. Pocket lint weighs us down and creates the wrong kind of bulge in our jeans. Wouldn’t it be great to be able to go out without stuffing anything in our pockets? Footloose and fancy free, as Levi Strauss doubtless intended. We’re so used to pockets that we often forget how ugly they look. They ruin the clean lines of fine tailoring, destroying the smooth minimalism that Apple’s Chief Design Officer Jony Ive favors. Plus, pockets can be easily picked (as my brother-in-law discovered last week, when a drunken night on the town cost him his iPhone). If only his iPhone had been attached to his body, so it could not be so easily pinched. What if he could strap it to his wrist with an elegant strip of fluoroelastomer? Apple originally conceived the iPad as a companion device to a Mac. In fact, you needed a Mac (or a PC with iTunes installed) just to set up the tablet. But it didn’t take long for iPad to become a stand-alone device in its own right. Similarly, today the Apple Watch is merely a companion to an iPhone. You need an iPhone to set up Apple’s wearable, and it’s pretty much unusable when your iPhone is out of range. But things are unlikely to stay that way for long. An Apple Watch with built-in LTE could work as a stand-alone product. You could set up and manage the smartwatch via a web app on iCloud.com. And once you configured your LTE-enabled Apple Watch, it could eliminate the need for an iPhone altogether. At least some of the time. The iPhone has become more than just a phone. As its size relentlessly increases with each new version, the iPhone morphed into a mini-tablet we carry with us everywhere. And that’s great most of the time. But there are occasions, like when you go for a jog, or for a night out, when you don’t want an expensive mini-tablet in your pocket. It feels unwieldy strapped to your arm during a workout, and thieves could easily swipe it in a crowded street. On such occasions, you might want to sacrifice the iPhone’s large screen for something more secure and compact. With its tiny screen, an Apple Watch may not prove quite as handy to use as an iPhone. However, with built-in data, it would be just good enough to let you check text messages and make short voice calls on those occasions when you want to leave your iPhone at home and travel light. In other words, an LTE-equipped Apple Watch would not replace an iPhone, but it would no longer be a companion to an iPhone, either. You could choose whether to take your iPhone or Apple Watch in the same way you choose what to wear. Especially if Apple does a deal with the phone networks to duplicate your SIM card onto the watch’s built-in virtual SIM. On those occasions when I want to travel light, ideally I would travel very light indeed. Without anything in my pockets at all. 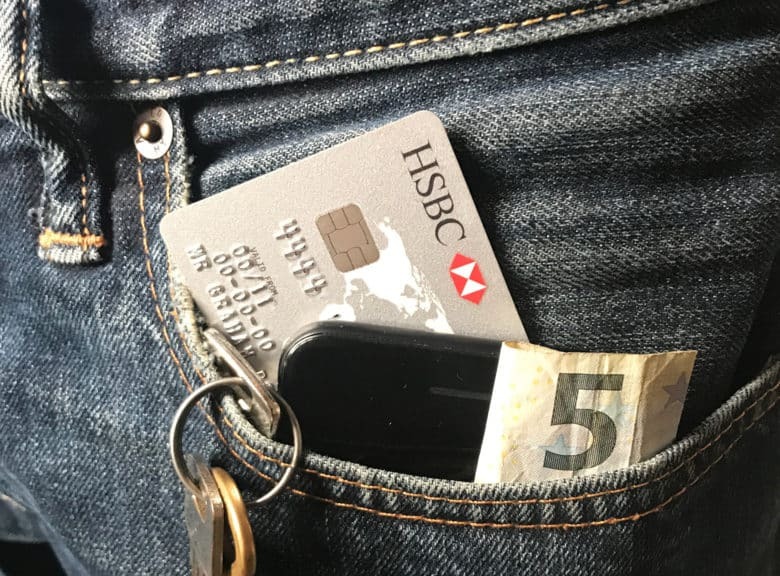 Imagine going to a busy night club, or standing in a crowded subway train, and not needing to keep your hands over your pockets to deter pickpockets. Or running to catch a bus without the contents of your pockets jingling like the bell on a cat’s collar. If you study Apple’s recent innovations, you’ll see a pattern of eliminating much of this pocket lint. Thanks to Apple Pay, we no longer need to carry credit cards. In iOS 11, Apple Pay Cash will eliminate the need for coins, too. IOS 11 also introduces Core NFC, which enables third parties to access the contactless tech built into Apple Watch. So my gym membership card soon could integrate into my watch. Apple already sells third-party HomeKit-enabled smart locks. I wouldn’t be surprised to see more advances in this area, like the ability to access your house key using the same double-press on the side button used for Apple Pay. That just leaves my Hubba Bubba. Sadly, I’m not sure there’s much Apple can do to virtualize bubble gum. But at least it will give Cupertino’s engineers something to chew on.